Discovery's Destination America network will air what it says is the first televised exorcism in history on Oct. 30, 2015. The program will follow ghost-hunters as they go through the story and actual house of a real life 1949 event that inspired the 1971 novel and 1973 film, "The Exorcist." NEW YORK, Aug. 1 (UPI) -- A reality television first is scheduled for the eve of Halloween this year: The telecast of a live exorcism. 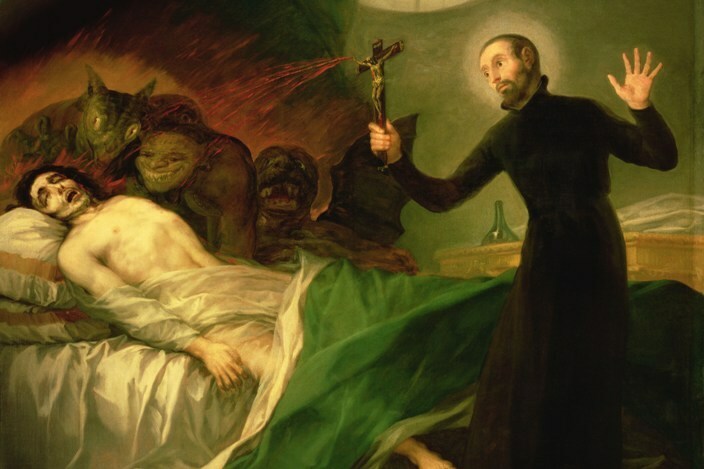 Discovery's Destination America network will air Exorcism: Live! on Oct. 30. The program will revisitthe real life story -- and the house -- that inspired William Peter Blatty's 1971 novel and William Friedkins's's 1973 film -- both titled The Exorcist, the Hollywood Reporter said Friday. 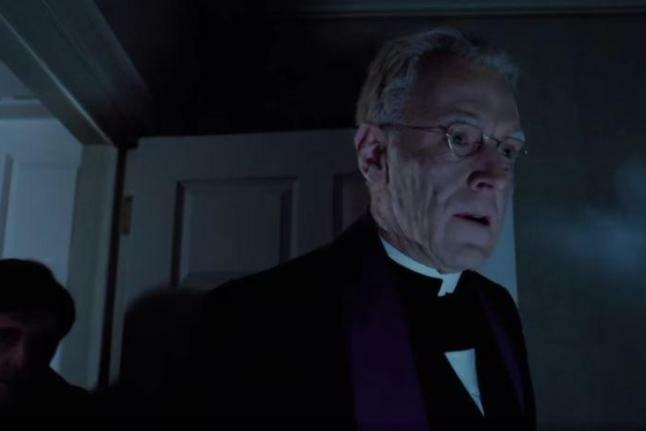 The film, starring Linda Blair and Max Von Sydow, focuses on a demonically possessed girl and a priest's efforts to rid the devil from her body. The film was based on an actual event in St. Louis in 1949, which will observe its 66th anniversary this year. "No one has ever attempted to rid the lurking spirits and demons that inhabit this home -- until now," promotional material for the program says. A team of paranormal investigators will go through the house, using modern ghost-hunting technology, the Hollywood Reporter said. Viewers will also be able to add to their experience by viewing a number of live cameras placed throughout the home, and communicate via social media, the Los Angeles Times reported. "As we step into one of the most haunted and well-known spirit destinations in America, Exorcism: Live! will show exactly what is inside this infamous, highly dangerous and possessed home," Destination America General Manager Marc Etkind said. "By actually exorcising this iconic house live, Destination America will do what it does best -- bringing never-before-seen experiences to television." Exorcism: Live! will air Friday, Oct. 30 at 9 p.m./8 p.m. Central, the network said. The priest delegated by the Ordinaryto perform this office should first go to confession or at least elicit an act of contrition, and, if convenient, offer the holy Sacrifice of the Mass, and implore God's help in other fervent prayers. He vests in surpliceand purple stole. Having before him the person possessed (who should be bound if there is any danger), he traces the sign of the cross over him, over himself, and the bystanders, and then sprinkles all of them with holy water. After this he kneels and says the Litany of the Saints, exclusive of the praryers which follow it. All present are to make the responses. The Litany of the Saints is used in ordination, Forty Hours', processions, and other occasions. Both the Roman Ritualand the Roman Pontifical direct that the first three invocations be repeated. The music for this litany is given in the music supplement. The invocations are sung (or recited) by the chanters or the priest; the responses by all. 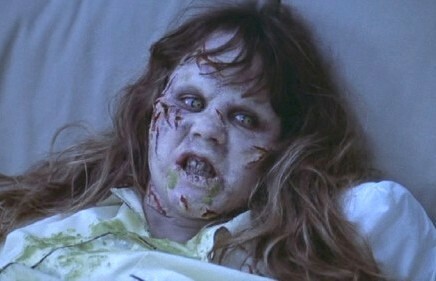 What does the Catholic Church say about exorcisms? Father Jordan Aumann, O.P., a noted professor of spiritual theology, offers the following explanation and definition: Diabolical possession is a phenomenon in which the devil invades the body of a living person and moves the faculties and organs as if he were manipulating a body of his own. The devil truly resides within the body of the unfortunate victim, and he operates in it and treats it as his own property. Those who suffer this despotic invasion are said to be possessed (Spiritual Theology, p. 408). However, the soul cannot be entered or overcome and thus remains free; in a sense, the soul really the person is like in a state of suspended animation. Pope Benedict XIV in his teaching De servorum Dei beatificatione, et beatorum canonizatione stated, Demons, in the individuals whom they possess, are like motors within the bodies which they move, but in such a way that they impress no quality on the body nor do they give it any new mode of existence nor, strictly speaking, do they constitute, together with the possessed person, a single being. In determining whether a person is possessed by the devil or his demons, the Church would first make sure he underwent thorough physical and psychiatric examinations. Eliminating these natural causes, Church officials would seek other signs: unexplainable physical phenomena, such as levitation or the uncaused movement of objects; the knowledge and usage of archaic languages which the person would have no way of previously knowing, such as speaking Aramaic; and the secret knowledge of a persons life, particularly the exorcist, which no other person would know. The devil also reveals his presence by acts of anger and violence, and through blasphemous, sacrilegious, profane, and obscene remarks. 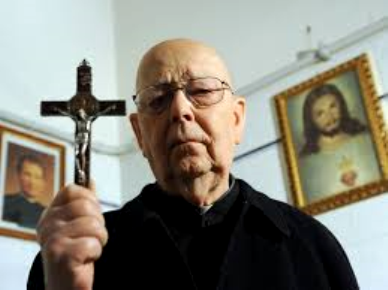 The bishop would authorize an exorcism only after serious examination and a careful weighing of all of the evidence. The Roman Ritual prescribes a Rite of Exorcism, a series of prayers, blessings and invocations in the exorcizing of the devil. The holy arsenal of weapons used in an exorcism include sacramental confession, the reception of Holy Communion, fasting and prayer (particularly saying the Rosary), the use of sacramentals (like blessings with holy water, the presence of a crucifix or other religious images), blessings with the relics of saints, and the invocation of the names of Jesus, the Blessed Virgin Mary, and St. Michael. The ritual is repeated until the devil is cast out of the person, at which time the exorcist petitions God to never permit the devil to possess the person again.